St. John Neumann’s feast day is celebrated on January 5. 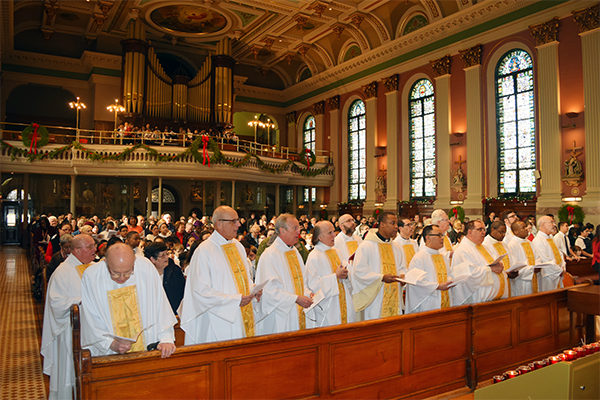 Redemptorist priests gather at the upper church during St. John Neumann’s feast-day Mass. Novena to St. John Neumann, C.Ss.R. St. John Neumann, acknowledging our dependence upon Almighty God and recognizing the power of your intercession, we come to you because many prayers have been answered through your intercession. You were an inspiration to all who knew you. You went wherever the care of souls required your presence. You were always an example of charity and sacrifice. It was your life of virtue which merited a place in heaven. As we submit to the will of God in heaven, we pray that our petitions be granted for His honor and glory and for the salvation of souls. St. John Neumann, pray for us. St. John Neumann, manifest yourself to all who seek your help. Teach us to prefer God in everything we do. Protect us from spiritual and temporal harm. Alleviate the sufferings of the poor, the aged, and the infirm. Many times you experienced the sorrows of life, and yet you overcame those trials. Show us how to overcome our trials and tribulations. We want to grow in faith, hope, and love. Never let us forget that we are temples of the Holy Spirit. May we always be worthy of that honor. St. John Neumann, intercede for us. St. John Neumann, you had great devotion to our Eucharistic Lord. Pray that we may know and love the Eucharist as you did. Give strength and courage to the Vicar of Christ. Protect our bishops, priests, and religious. May all people be zealous for the kingdom of God. Enlighten the minds of people who seek truth. Lead them to the path of justice. How good it is to know that you will never forget our families, relatives, and friends. Protect our loved ones away from home. May your prayers comfort the souls of our departed brethren. 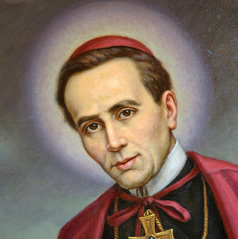 St. John Neumann, pray that we may live and die in the state of grace. Look upon us with favor, St. John Neumann. We claim you as our very own. You are familiar with the places where we live, work, and pray. As a priest, you lived here among our forefathers. You taught them. You blessed them. You prayed for them. How often they gathered to pray with you. You did this so that they might enjoy the glories of heaven. Just as our predecessors came to you, so now we come to you. We are confident you will not disappoint us. Pray for our intentions. Whatever God grants through your intercession, we accept with a deep sense of gratitude. We thank Him. We praise Him. We want to be with Him forever. Almighty God, you placed the holy confessor St. John Neumann among the elect of Your sanctuary. May his life be an inspiration to all who seek eternal glory. May our prayers be answered through his intercession. May they be answered not only through his intercession but most especially through the merits of Jesus Christ, Who lives forever and ever. Amen. The novena prayer to St. John Neumann is prayed by the congregants at the National Shrine of St. John Neumann every Wednesday after each Mass and has been for many years. Please join your prayers with ours on Wednesdays as we implore St. John Neumann for his powerful and prayerful intercession and ask this through Jesus Christ, Our Lord and Savior. Amen.